Sussman Lawrence was a staple in Minneapolis’ indie rock scene when I was growing up. And band member, Peter Himmelman, who went on to pursue a solo career, was a local hero. Like millions of other Americans in his fifties, he found himself and his ways outdated and outmoded. He needed to transform. And it was scary as hell. Immobilizing in fact. 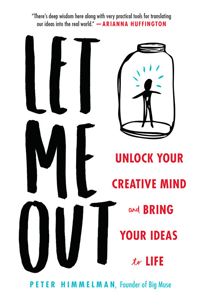 Let Me Out is Peter’s prescription for overcoming fear and taking action toward your “what’s next.” It’s gentle, supportive, and filled with easy frameworks for the apprehensive. Mostly, it exudes authenticity and poetry as one would expect from a singer-songwriter.